Bring the magic of Hogwarts to every day with the Harry Potter Crests Gift Box Set. Styled with intricate Hogwarts crests, each piece in this gift set features vibrant colours and bold designs inspired by the Wizarding World. 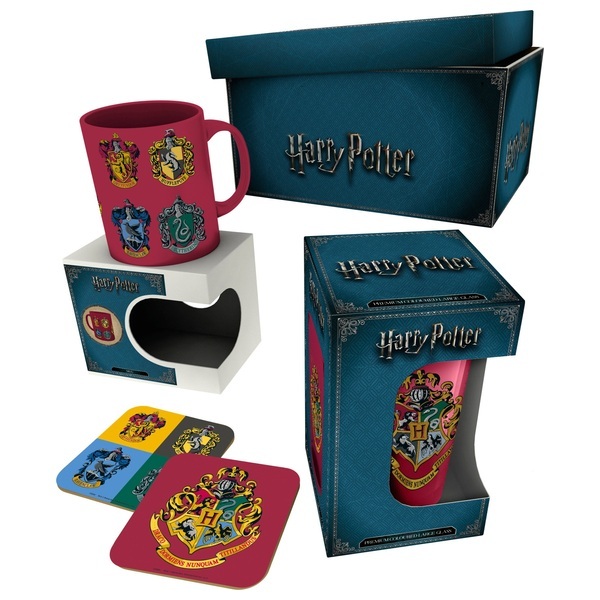 The Harry Potter Crests Gift Box Set includes a mug, a pint glass and 2 coasters, each with its own Hogwarts design. The red mug is decorated with all 4 Hogwarts crests: Ravenclaw, Hufflepuff, Slytherin, and of course Gryffindor. A coaster in the Hogwarts house colours also features the 4 house crests, each one designed to look just like the crests in the movies. The Harry Potter Crests Gift Box Set includes a colourful pint glass decorated with the Hogwarts crest, and a matching red coaster completes this magical set. This gift box makes a beautiful present for Harry Potter fans and collectors, adding a touch of magic to tea breaks, kitchens and coffee tables.